New York officials had less than 24 hours’ notice that Long Island City had been selected as Amazon’s HQ2. They had considerably more time to digest the possibility Amazon would pick more than one winner. Amazon started negotiating terms with New York and northern Virginia about two weeks prior to finalizing the deals. New York City Economic Development Corp. spokeswoman Stephanie Baez said her city was notified around that time that Amazon may choose multiple locations for the $5 billion, 50,000-job project. Virginia had six weeks’ notice. By the time Amazon closed the deals on Nov. 12, dividing HQ2 between a location in New York City and another in northern Virginia, officials had gotten used to the idea. Only half of the new HQ2 positions will be technology jobs. Whether it’s claiming public subsidies for fulfillment and delivery jobs eventually poised for automation or collecting billions in incentives from New York and northern Virginia to split HQ2, Amazon has shown it can play governments against one another for a prize that might be less than expected. “Amazon pretty much gets to do whatever they want and that’s what they did,” Toronto Global CEO Toby Lennox, who helped craft the city’s proposal, said of Amazon’s decision to divide HQ2. Amazon said it made the decision in early September after reviewing the finalist proposals and found two headquarters would help the company recruit more employees. Amazon’s Nov. 13 announcement that it would split HQ2 into two cities with at least 25,000 jobs and open a third new office in Nashville came as a surprise to many — including HQ2 finalists. Although Amazon had visited all 20 HQ2 finalist sites by May, economic development officials in some of those cities said that was the extent of their communication with the company. When arriving for site visits at the HQ2 finalist cities, Amazon representatives introduced themselves using only first names — and no titles, according to economic development officials who asked not to be named so as not to compromise future work with Amazon and other companies. In March, a team of 11 Amazon officials visited Raleigh, North Carolina, and had no meaningful discussions after the visit, sources said. That same month, about a dozen Amazon officials visited Atlanta during which the train they were riding broke down. A source who worked directly on Atlanta’s bid said Amazon had not been in contact since the site visit, nor did developers associated with the proposed project hear from the company. Toronto officials learned about Amazon’s decision through media reports, although they received an update from Amazon this summer to say they were “still working through the process and had not yet made a decision,” Toronto Global spokeswoman Erika Thompson said. Amazon spoke to Toronto officials the day after the HQ2 announcement, to debrief and “leave the conversation open for future possible opportunities to work together,” she said. In Nashville, Amazon notified officials that the city had not been selected about 30 days prior to the company’s announcement. But that gesture paved the way for another deal outside of the HQ2 sweepstakes. Denver Metro Chamber of Commerce Vice President of Economic Development Sam Bailey said Amazon told the city it was still in the running as of Nov. 6 and was also being considered for “other opportunities.” Denver learned on the morning of Nov. 12 — a day before Amazon’s public announcement — it had not been selected. Amazon then followed up with Denver on Nov. 14 to “discuss next steps,” Bailey said. Bailey declined to share additional details, citing the organization’s policy not to comment on ongoing business. Incentives alone aren’t enough to lure Amazon, but they provide a bonus in places where Amazon was likely planning to grow anyway. And, to some onlookers, the decision seemed settled from the outset. New York and the Washington, D.C. area are home to Amazon’s fastest-growing businesses — advertising and cloud computing. Amazon said the information HQ2 bidders provided is widely accessible. Amazon has already used the HQ2 search to scout new offices in cities that weren’t among the 20 finalists. Amazon has announced plans to add more than 6,625 jobs at technology hubs in cities around the U.S. and Canada in the year since sending out its HQ2 request for proposals, which drew 238 submissions. 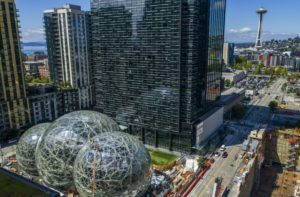 Amazon didn’t select Vancouver, British Columbia’s proposal as an HQ2 finalists but the city is still getting 4,000 Amazon technology jobs — and it didn’t offer any incentives. Nashville agreed to $105 million in incentives for its 5,000 jobs. Stephen Moret, president and CEO of the Virginia Economic Development Partnership, said the state cut its incentives package roughly in half to reflect the HQ2 split. New York City Economic Development Corp. hasn’t responded to a request about whether or how New York adjusted its offerings. Amazon asked all of the original 238 bidders to sign nondisclosure agreements, although the company confirmed in an email to the Puget Sound Business Journal that those nondisclosure agreements only apply to Amazon-related confidential information. Cities can share the proposals as they wish, Amazon said. Some cities have withheld some or all of their proposals. In one case, Miami-Dade paid $1.5 million in incentives and a $5 million bond for an Amazon fulfillment center, but Amazon ultimately scaled back the number of jobs and cut the average wages. Mike Mullis, a site selector for Bezos’ rocket company Blue Origin, “constantly hammered” Washington state-based officials in 2016 about what incentives they could offer in exchange for the company’s $200 million engine manufacturing plant, according to a source who signed a non-disclosure agreement and asked not to be named. Mullis said that characterization was consistent with how he operated. Meanwhile, Amazon has in recent years collected at least $1.2 billion in public subsidies for its U.S. fulfillment and delivery network. Some of the jobs in that network are set to be automated. American City Business Journal editors and reporters including Casey Coombs, Katie Arcieri and Adam Sichko contributed to this report.